As a life-long resident of Oklahoma, Robb Hopper has a firm understanding of the Tulsa area and its surrounding communities. He has earned a reputation as a home construction expert having built, flipped and remodeled hundreds of homes. 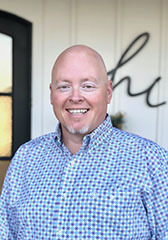 As a full-time real estate agent with a focus in home construction quality, community and customer service, Robb has sold a wide variety of properties and formed a strong foundation of repeat clients. Currently, Robb is recognized as a Top Realtor by TulsaPeople magazine. Sold a Single Family home in 2017 for approximately $175K in Coweta, OK.
Robb did an amazing job selling our home! He and his team do a fantastic job communicating in a fast and professional manner. He listens to needs and is an excellent resource to navigate the process of selling a home. I HIGHLY recommend him! Sold a Single Family home in 2015 for approximately $275K in Skiatook, OK. The Hopper Group helped me during the most devastating time in mine and my boys' lives. My husband passed away unexpectedly and I was at a loss emotionally, not knowing what to do with an overwhelming amount of land tend to alone. We prayed and knew that it was time to sell and three days after putting the house on the market, it SOLD! They helped me find the most perfect home for my family, took away all of the stress of the unknowns and they are still my go to for repairs and advice. Bought and sold a Single Family home in 2016 for approximately $200K in Jenks, OK.
Amazed how fast Robb and staff sold my house and got me into our new home that we love so much!! Super response time and adorable staff! Best experience ever and highly recommend!!! Bought and sold a home in 2016 in Collinsville, OK.
We had a hard time selling our house with our first realtor. When we changed realtors, The Hopper group came in and sold our house within the first month! They help every step of the way with building our dream home! Sold a Single Family home in 2016 for approximately $250K in Williamsburg, Tulsa, OK. There aren’t enough words of praise to express our gratitude for the way you handled the sale of our Tulsa home! The fact that it sold for full list price within three weeks was amazing but not surprising considering the attention and diligence with which you approached the challenge of making the sale a success. We will definitely recommend you to anyone we know who is considering the sale of their home, and we will call upon you again when we are ready to buy another home. Thank you immensely for your perseverance and patience throughout the entire process! Bought and sold a Single Family home in 2014 for approximately $225K in Owasso, OK. Easily one of the best house buying experiences I've ever had. He took charge of what we wanted and needed and truly made it a seamless buying and selling experience. It wasn't just a one time thing either, he still checks up on me from time to time just to see how things are going in our new home. I would never use a different realtor. Robb has a level of knowledge, skill, and personality that really hits the spot. With great satisfaction and understanding, he can answer questions about construction, buying, selling, neighborhoods, city, rural, pools, fences, schools, and the list continues. Perhaps the X-factor that sets Robb apart is that he provides a valuable perspective. He shoots straight. Bought a Single Family home in 2014 for approximately $75K in Sperry, OK. Pleasure to work with, always available even when I have requested a viewing first thing in the morning. He works to complete my requests in a timely manner. I gave Robb my criteria for investment property and he has kept within my specifications. Bought a Single Family home in 2014 for approximately $1.325M in Owasso, OK.
We went through multiple realtors and viewed numerous homes before finding Robb Hopper. As first time homebuyers the process was daunting and confusing but Robb helped us through the entire process and always encouraged , advised, and assured us that we would find our ‘dream home’. With other realtors we constantly felt pressured into ‘upping’ our budget or simply felt rushed into placing an offer. Prior to finding Robb, we had convinced ourselves that we wouldn't find a home that had everything on our want list given our budget and the competitive market. We were ready to abandon house hunting until a friend had referenced us to Robb Hopper. Within a few short weeks Robb found the perfect home for our family! Not only are we confident that we got an amazing deal on our house but Robb also helped us to negotiate for several additional credits in our offer. House Hunting with Robb was a great experience! With Robb’s prior experience as a licensed contractor we felt certain he would place our family in a well-constructed home free of major costly repairs. We highly recommend Robby Hopper to all our family and friends that are in the market to buy or sell. Bought a Single Family home in 2014 for approximately $175K in Owasso, OK.
Robb is a boots on the ground, hard working, won't stop till the job is done right kind of guy. His extensive contractor background provides a great sense of security while looking at new and used home. We could always trust his opinions and recommendations and never doubted his integrity. I would, and in fact have, with no hesitation recommend Robb.